Sales training should improve the sales skill set within your sales team. But what else do you need to consider when faced with all the options you have when selecting the sales provider? Sales training that is not only perfect for your sales team needs but also gives the highest ROI…is that the absolute minimum requirement for you? What else might you need to consider? Here are some of the discussion point to table with your potential sales training provider before you sign on the dotted line. Whether you’re buying your first ever sales training course or your 100th, it’s always worth looking at what you’re expecting versus what you could/should be expecting from your training provider. How will the sales training course be constructed and delivered? You might be looking for a generic course, but not all generic courses are created equal. Generic usually means great value but may not always satisfy the precise needs of your business. What sales methodologies are being used? Are these singular sales methodologies delivered by practitioners or trainers (who deliver sales one day and SEO skills the next and excel the next)? Is the the training provider delivering via experience or because they read the book? What Training Needs Analysis does your sales training provider do pre-course construction? Do they analyse the last 6 months of sales results so they can advise you and ensure you get the training you need? How important is it for them to really understand your business and market place? How able are they to challenge your beliefs about what you want from the sales training from an independently informed position? What percentage of the course is generic versus bespoke? Will the course be road tested before delivery? What type and how many calls will they listen to during the design process? How many hours of pre assessment with the team will be needed to tailor the course? Will the sales trainer happily get on the phone/hit the field to do the job your sales team are doing to demo the skills in play? How will the training provider embed the new skills and knowledge is embedded in the sales function and the business? What process will be used to embed the sales training in the team? How is your sales training provider going to prevent this happening? How much time with they spend with the sales management team to ensure the knowledge and skills are embedded? What does the knowledge transfer process look like? Are their any skills matrix to assess and audit the sales team against pre and post training? What do they look like and what is the diagnostic behind the skills matrix? How much of the training is talking versus doing? What does the training follow up assessment look like? How ill they measure behaviour changes in the team? How will the sales training team get to know your industry? What competitor research with they do? What will that consist of? Will you get a copy of their findings? How will they use that to inform/improve the training? These are all valid questions if you’re expecting your training to stick and behaviours and results to change as a result of the training intervention. Today, HOW you sell is as important as WHAT you sell. In highly competitive and discount driven markets this is even more so. So, whether you’re selling a heavily commoditised product/service or a niche product/service, the facts are clear. Great sales training will mean the difference between being seen. Seen by your prospects as opposed to being lost in a sea of competitors. 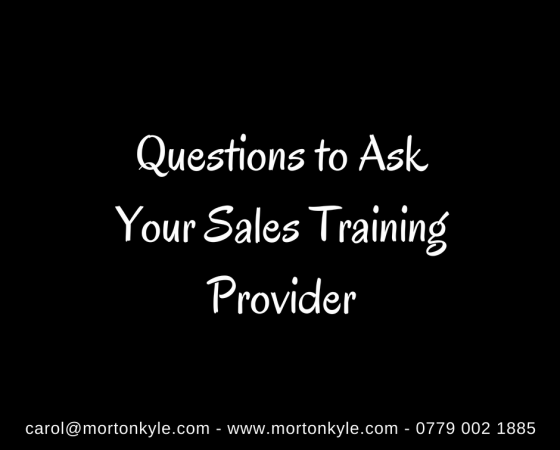 At Morton Kyle, we deliver extensive sales training programs for across many sales functions and industries. If you’re looking for results driven sales training, call to discuss how we work with sales functions to improve sales results and create clear competitive advantages in your sales team. You can contact us on carol@mortonkyle.com or call Carol on 0779 002 1885. Alternatively we access online sales and business development training via TurboCharged Sales. However to discuss your very specific sales training needs, please contact us directly to discuss. This entry was posted in Blog, Business Development, Sales Performance Management, Sales Pipeline Management, Selling and tagged B2B Sales Training, Face to Face Sales Training, Online Sales Training, Sales Coaching, Sales Trainging, Sales Training Courses, Telephone Sales Training, UK Sales Training. Bookmark the permalink.